Last day of vacation and we travel back home. Flights take us from Venice to Frankfurt to Houston and then to home. We arrive quite late, but we will be sleeping in our own bed tonight. Wonderful castles and palaces with many original furnishings and tapestries. Hot tea served with milk. Nice countryside when the weather is pleasant and you have a car. Like most urban areas, has some seedier parts of town and definitely some grit and grime. Too many noisy cars blowing their horns. Food has improved (from the horrors I have heard) but is still borderline in many places. Interesting geography with mesmerizing collection of canals, bridges, and walkways. Many cafes with outdoor sitting, attractive viewpoints, and pretty good coffee. Many ways to combine walks. Beautiful water taxis (like fine wood Cris Craft boats). Challenging language (but mostly patient Italian hosts). Buildings in disrepair (however Shawn points out that you would need more money than God to restore and maintain them). Our plan today was to get to St. Mark’s Square in the morning and see if we might be able to see the interior of either St. Mark’s Basilica or the Doge’s Palace. When we arrived, we were surprised to find that the square was already busy. However, after having used the Rick Steve’s audio guide for the square on the previous day, we already were aware that tickets for the Doge’s Palace could be purchased at the museum in the far corner of the square where there were much shorter lines. Where we purchased the ticket, there was another museum which we decided to tour for awhile before going to the Palace. It had some interesting architecture and displays, but we didn’t want to be in museums all day. So, we left after approximately 2 hours. We were going to have a snack in the museum cafeteria, but the woman providing service seemed to totally ignore us, so we left to find food elsewhere. Shawn wanted to try a cafe in the square. I was feeling defiant about paying inflated prices, so I grabbed a sandwich in a bread roll like a calazone and shared a little of it with Shawn. Then we went to the Doge’s Palace. The line for ticket holders was fast in comparison to the line for people waiting to purchase tickets. Unfortunately, the line we went it didn’t include the opportunity to get the audio tour equipment. So we just used the information posters in each room to get a description of the room’s purpose and artwork. It was okay, but at times there was a crowd around the posters which made reading the information more challenging and the rooms were a little dark which also meant that it took a little more effort to read. The Doge was the chief magistrate for the city of Venice and the Palace was the living quarters for the Doge’s family, the meeting rooms for the Doge’s council and the government and the place for legal proceedings, as well as the prison. It had been built and expanded over time like the palace at Hampton Court. And like Windsor Castle, it had been exposed to fire (although hundreds of years earlier). The palace had many rooms; I last noticed the room count at 36. There were astoundingly high ceilings, ornately carved fireplaces, and tremendous numbers of frescos and paintings. The eye could not take in all the sights. It could make you numb, like a kid who ate too much candy and suffered an overdose of sweet. I think by the 30th room, it all became a blur. We merely scanned the last rooms and then did a quick pass of the prison cells. I stopped by the gift shop to purchase a few postcards since we were not allowed take photos. Then we agreed it was time to enjoy the outdoors and more of the beautiful sunny day. We walked to one of the vaparetto stations and took a trip over to the island of Lido. It is 12 km long, but only 1/2 km wide. We found a few cafes near the town site and decided to sit and have a late lunch. Shawn got a sandwich and I ordered a caprese salad (tomato and mozzarella) and we shared. Afterward, we got a couple of cones with gelato and we walked to the east across the island. At the other side of the island, we walked north along the beach on the shore of the Adriatic Sea. It was very warm and sunny. When we had reached a series of beach cabanas, we found a gate back to the street and walked south again and the back to the town. After walking in the sun, we were ready for a cold drink and we found a vendor and bought some diet Cokes. We hopped on the next vaporetto back to Venice. At the hotel, we put up our feet and had a rest for awhile. We didn’t feel like we needed a big meal, so we went to a nearby snack bar and shared a pizza and a pastry with coffee. Then, back at the hotel, it was time to do our packing. We had done and seen a lot on this vacation. It was a great first trip to Europe and I wouldn’t turn down another chance to visit more countries. Walk your feet off and get an eye full! Today we planned a day of walking. Our plan was to take the vaporetto to the south end of the Grand Canal and then work our way back to the hotel along a walking tour. We had no problem with getting the correct vaporetto and we used an audio tour on our iPhones to get the highlights of the features along the way. Because we had lovely weather, we could sit at the very back of the boat, outdoors and see the sights on both sides. The vaporetto was not very busy. Due to a slight interruption to the vaporetto route due to the visit by the pope, we had to get off one stop early, but it made very little difference to us. 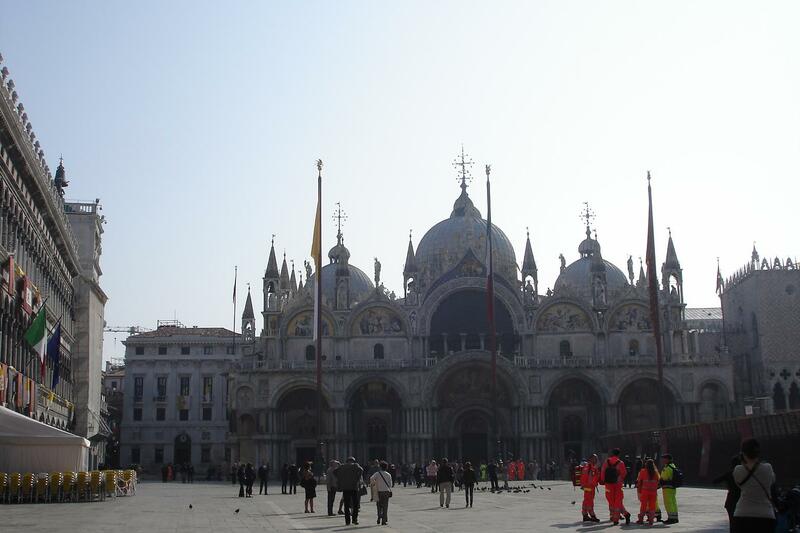 After disembarking, we walked to St. Mark’s Square. Originally, we had thought we should avoid the square because of the pope’s visit, but it was not crowded at the time we arrived. So we decided to follow the audio tour for the square. 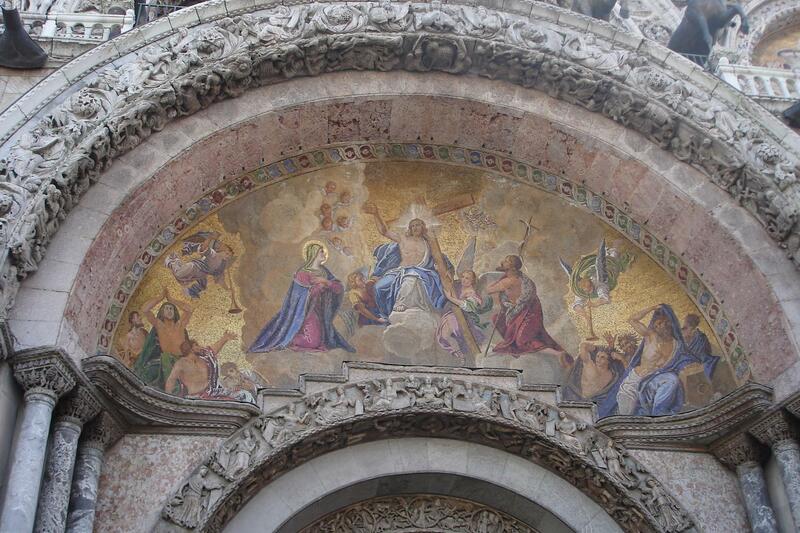 The tour had us stroll the inside perimeter and described monuments, the basilica exterior, and the statuary. It was very educational and entertaining. Afterwards, we strolled along the water’s edge of the lagoon and had a pleasant stop at a cafe for a caffe latte. We decided to just wander in the Castello district for awhile, since we were on the wrong side of the canal for our original planned walking tour. It was fun to wander in the narrow alleyways and discover new squares (campo). 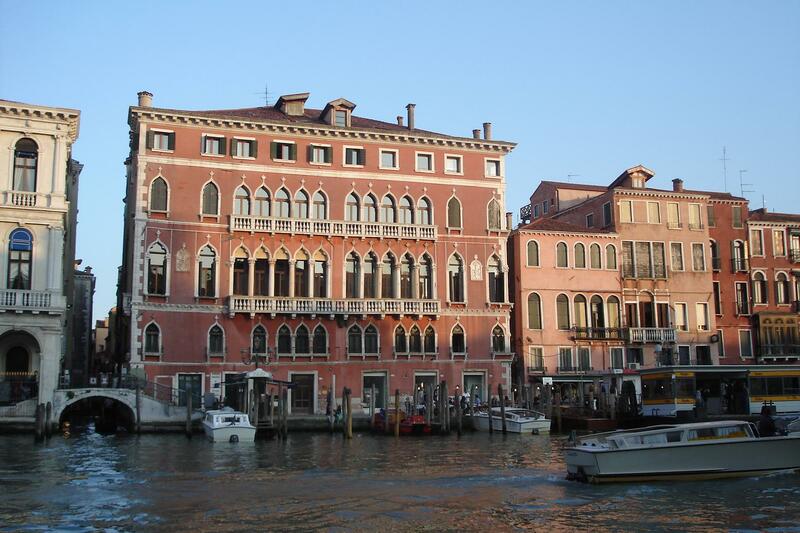 After a little while, I suggested to Shawn that we should go to see La Fenice, an opera theatre that has burned down and been rebuilt several times. We could only view the exterior. We wandered a little longer and then decided to have some lunch at a cafe in Campo St. Stefano. We shared a seafood salad with smoked salmon, shrimp, and crab and a crepe with artichokes, cheese and prosciutto ham. Both were excellent. During our afternoon wandering, we came to Istituto Veneto di Scienze, Lettere ed Arti. 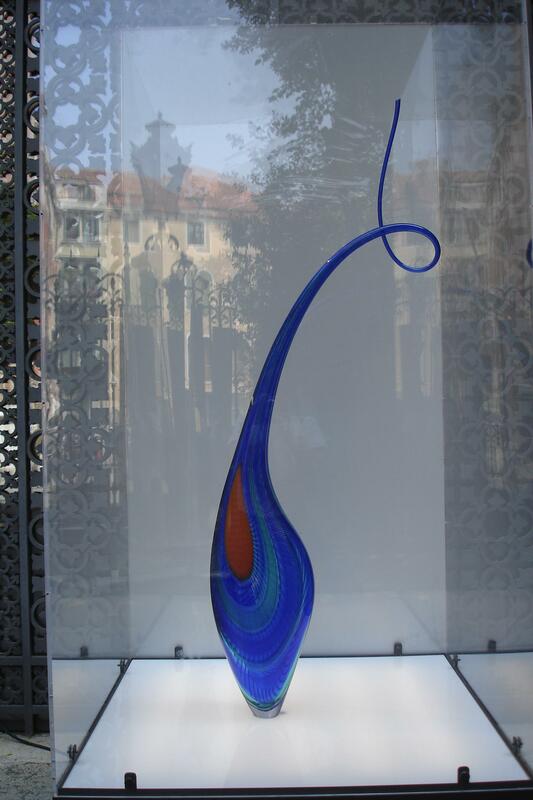 Today it had a display of glass art by Lino Tagliapietra who studied in both Venice and with Chihuily in Tacoma. As we looked at a piece in the front of the building, an English couple said we should go inside to see the display. So, we decided that the admission price was reasonable and we would have a look. We had not realized that the backside of the building was on the Grand Canal at that as we were wandering through the displays, the canal was being cleared of all boats and bridges cleared of pedestrians for the pope’s canal trip. The museum had opened some doors to the balconies and patrons were stepping out to watch the pope pass by. We decided to have some patience and hang out for a few minutes on a balcony with two Italian women. After a 15 minute wait, there was a procession of security boats, police boats, water taxis carrying a couple of cardinals and then the pope. 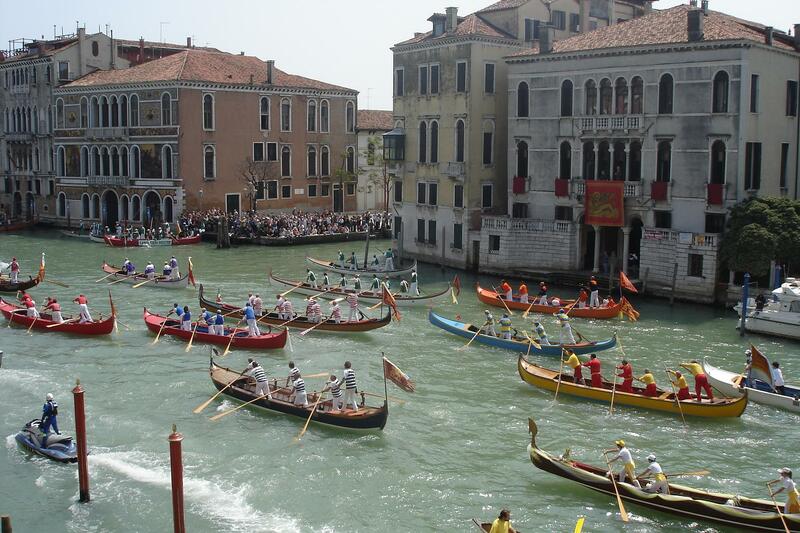 These boats where followed by a gaggle of gondola type boats that could be rowed by 5 or 6 standing oarsmen. Each boat had rowers in color coordinated attire. What a colorful parade! 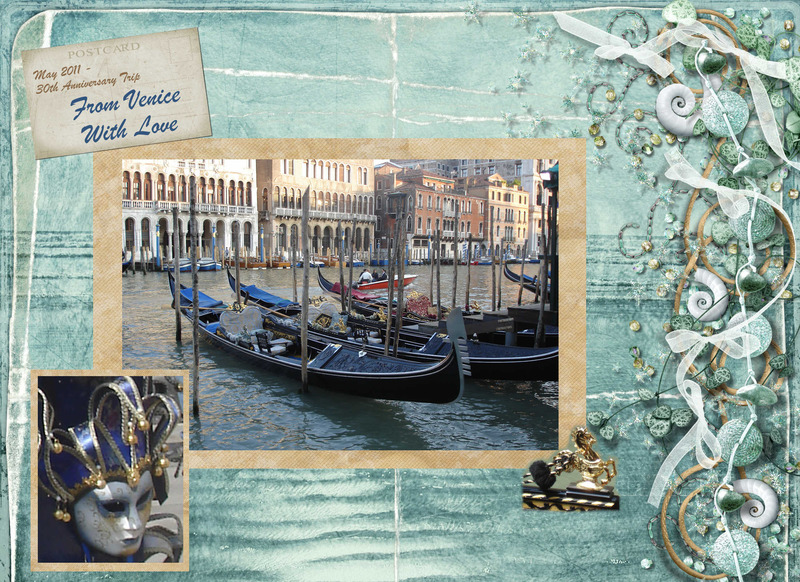 When we had completed our tour of the glass art, we crossed the bridge at the wooden bridge Ponte Accademia. We started along the route of our original walking tour. We started at Dogana da Mar (customs house) and walked along the walkway of the south shore of Venice proper at Canale della Giudecca. As with other aspects of Venice, I was saddened to see the extensive defacing of the walls by graffiti. Shawn was getting tired feet and losing interest in our walk. So, from Campo Barnaba, we went out to the canal and got a vaporetto back to the hotel to have an afternoon rest. After some time spent resting our feet, we went across the bridge by the train station and had dinner at a restaurant with a table on the canal. 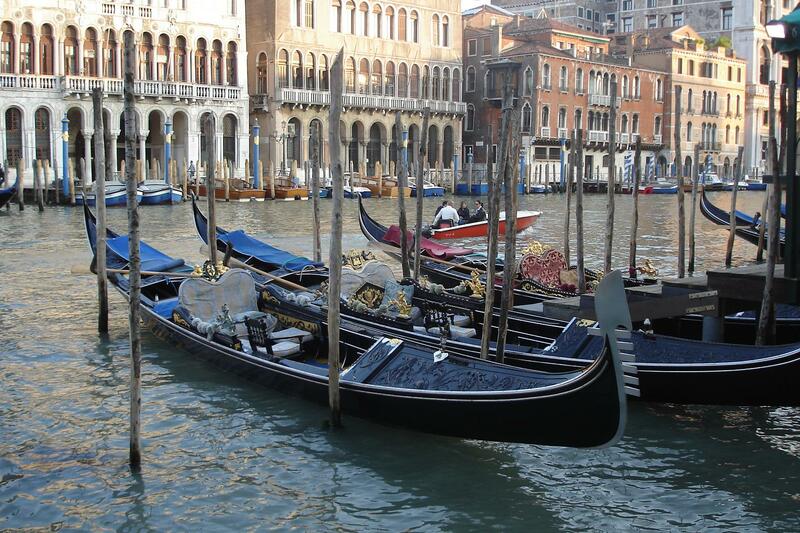 We watched the boats traveling back and forth, including a few gondola as we enjoyed a pasta dinner. We shared spinach ravioli with a cream and gorgonzola cheese sauce and some lasagna. After our dinner, we walked through the Jewish ghetto and had a pastry and coffee at a pasterria. Posted on May 8, 2011 August 2, 2011 Categories Other travelLeave a comment on Walk your feet off and get an eye full! On the train, we learned that the Pope was going to be in Venice. The hotel staff warned us that we should avoid St. Marks Square on Saturday and Sunday. So we decided to go to the island of Murano to see the glass blowing. The hotel told us that one of the studios would send a boat and we would be able to return on a vaparetto (water bus). So we thought that sounded like a good arrangement for us. Shortly after 9 am, the boat arrived and we had a lovely trip to Murano. Once there, we were shown a glass blowing shop and an artist demonstrated the techniques of blowing a vase and molding a fish. After the demonstration, we were shown through many rooms with so many styles of glass with unique molded pieces of art, gorgeous mirrors, and unbelievable candeliers. We were also shown rooms with lovely goblets, vases, candle holders. After some discussion, we selected a few pieces as a dining table arrangement with a fruit bowl, two candle holders, and a vase. They have a beautiful black and gold spiral embedded in clear glass. 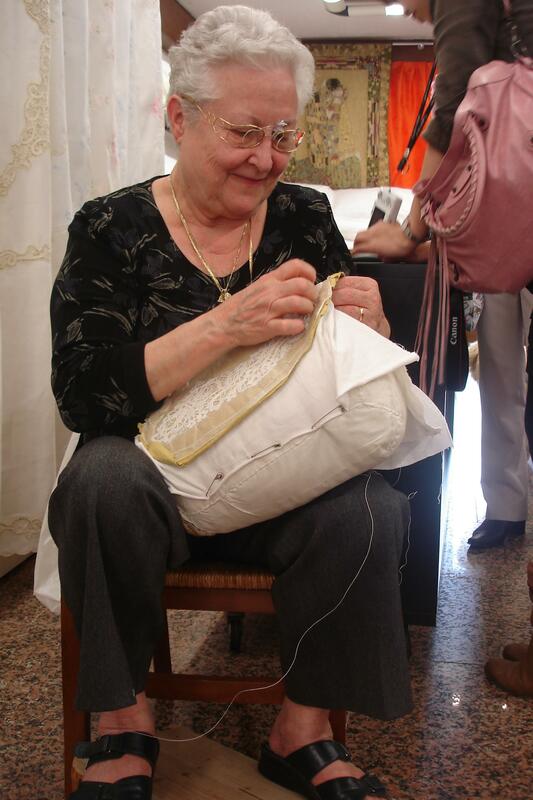 After our tour of the gallery, they suggested a trip to Burano where there is a community of fishermen and lace makers. The gallery provided a boat to ferry us to the next island. We were met by a local woman, Gorgia, at the drop-spot. She provided us with a description of the island and the basis of the economy. She showed us to a wonderful restaurant were we had a delicious baked sea bass for lunch, followed by a sponge cake and vanilla cream covered by a huge layer of merengue. Gorgia met us again as we were preparing to leave. She showed us to a lacy gallery set up by a shop owner and we were shown how lace is made. We were then shown a variety of place mats, napkins, and table runners. We selected a small linen table runner with lace trim in a beige color. It should show off our new glass pieces nicely on our dining table. We had some time to wander around the island. The buildings were painted in bright colors, apparently to make it easier for the fishermen to spot the island when coming in during foggy conditions. There were many shops and cafes. We wandered the streets and photographed the colorful buildings, winding canals and parked boats. We looked over some of the fishing equipment in a small boat harbor. 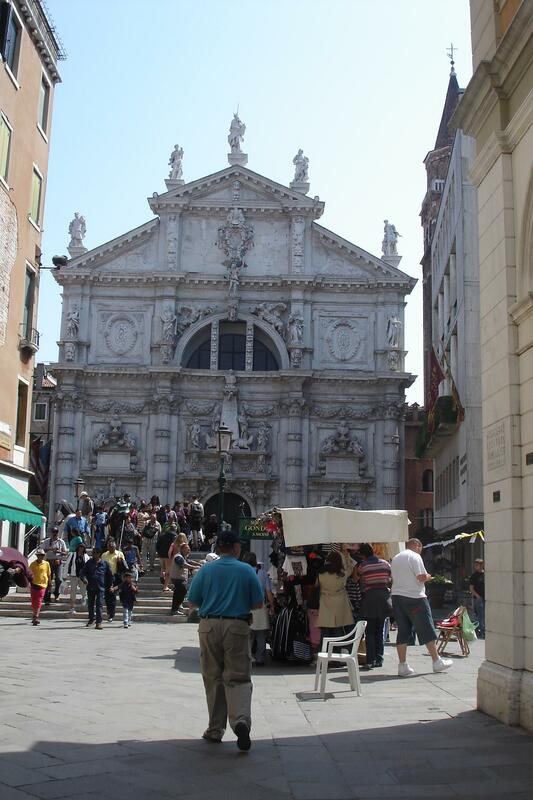 After our tour, we got a water bus back to Venice and returned to the hotel to drop off a couple items. Then went out to look around a few new corners. Within a short time, we decided that a small meal sounded good. We stopped at a small pizzeria and shared a pepperoni pizza. Then we went to a gelato shop for a small scoop of gelato. We stood on a bridge and watched the boat traffic as we enjoyed our cool treat. It was a full day and we were ready to put up our feet. We woke early and got up and dressed and washed before our scheduled time for breakfast when Rupert would come and make up our cabin. So that we didn’t effect Rupert’s schedule or get under-foot, we went to the bar car. Unfortunately, there was no coffee available there. We chatted with a couple of other people until 7:30 am and then went back to our cabin, which Rupert had reset into the sofa configuration. Once we were comfortable, Rupert brought us a continental breakfast. There were many biscuits and rolls, jam, and cheese and a large carafe of coffee. When breakfast was cleared away, Rupert would stop by to chat a little as he waited for the late risers to get up. During one of our visits, he related to us that he was the train steward for David Suchet when he did the documentary about the Orient Express. We thought Rupert looked familiar, but neither of us had voiced the question. We also asked Rupert about his favorite sights in Venice, since he lives nearby. Nothing came to his mind immediately, but when I suggested the island of Murano where they have the glass blowing shops he said that he would recommend that we see that. The train stopped in Innsbruck for 30 minutes and many passengers disembarked to walk the platform. It was beautifully sunny and warm. After our short “shore leave” we hopped back aboard and went to the bar car and Shawn had a diet soda. At our appointed time, we went to the dining car and had a lovely lunch with chicken as the main course and a small chocolate cake with a half pear for dessert. Then we retired once again to our cabin to watch the Italian vineyards roll by. Apparently, breakfast and lunch didn’t provide quite enough food, so Rupert also had “tea” for us at 4 pm. Fortunately, it was just tea and 3 bite-size pastries. Shortly after tea was cleared away, the train was making its approach to Venice across the land bridge. Once we arrived at the train station, we had a 20 minute wait for our baggage. We then had a short walk over a bridge and a few hundred feet to the hotel. We were ready stretch our legs, so we changed to some comfortable clothes and went for a stroll around Venice. There were quite a few other people on the move, but overall it was easy to stroll around. It was warm and there was a pleasant light from the sun as it dropped toward the horizon. It was interesting to walk down a narrow alley and then enter a large courtyard where 4 to 6 alleyways come together, usually with a church to one side. After a while, I suggested we get a Calazone to share so that Shawn wouldn’t be really hungry at 10 pm. We finished our walk around 9 pm. Tomorrow, we will enjoy exploring many more alleyways and bridges. 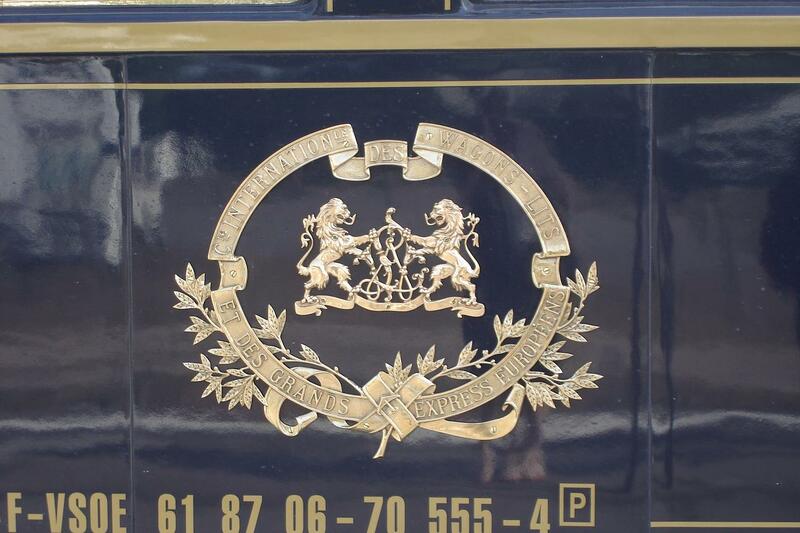 Today was the start of our London to Venice train ride on the Venice-Simplon Orient Express (VSOE). We had to be at the Victoria train station by 10 am, but since Shawn is so punctual and we had no place to be in the morning, we arrived at the train station by 9 am or so. We did our check-in procedures efficiently and then had a short stroll around the train station. I took a look for any magazine that might have published some photos of the Royal wedding. Many were pre-wedding publications and there was one book that had the lives of Prince William and Katherine (Kate) and a few pages of wedding photos. None were to my liking. We also found a currency exchange shop where we changed some British Pounds to Euros. We took a few photos of the train station and then returned to the VSOE passenger lounge for a cup of coffee. The lounge was comfortable and nicely appointed. When the time came, we boarded the train and sat at dining tables. Once the train left the station, we passed through many London neighborhoods which were not particularly noteworthy. In awhile, we began to see more English countryside as we headed southeast. Around noon, we were served a brunch of scrambled eggs and smoked salmon. By mid-afternoon, we arrived in Folkstone. We were met at the train station by a small brass band. 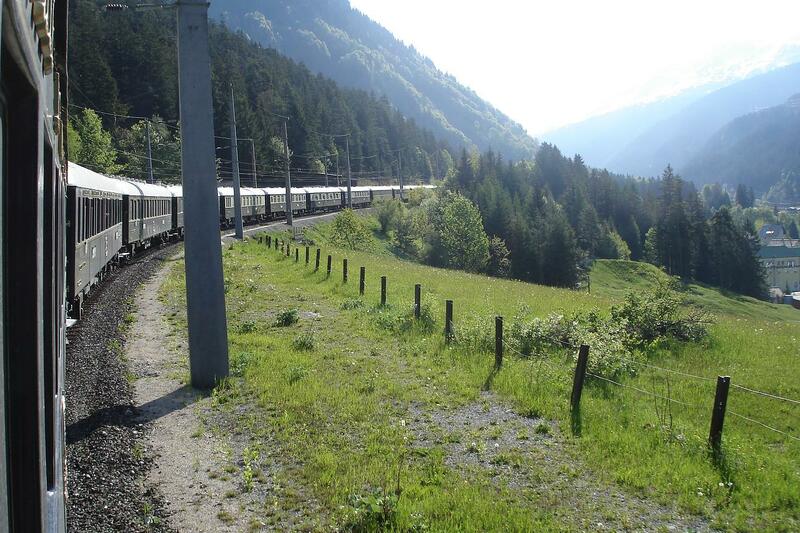 The VSOE staff directed us to some motor coaches and we drove to the depot for the Channel tunnel trains. Each train has several large container-style cars, which the motor coaches drive into and park. Once loaded, the train drove through the Chunnel with our view obscured by the side of the container. We were across the English Channel in about 40 minutes. Then our motor coaches disembarked and drove us to the train statin in Calais. We boarded the train and found our luggage waiting in our cabin. 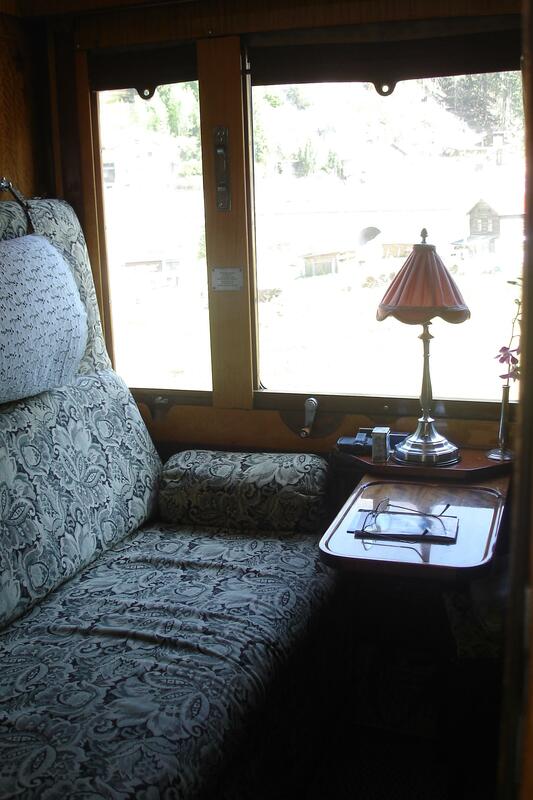 Our steward Rupert introduced himself and acquainted us with the features of the cabin and directions to the wash closets, bar car, and dining cars. We relaxed in our cabin/car while other people loaded on the train. When underway, the maitre d’hotel came through the cars and allowed people to elect there preferred dinner time. 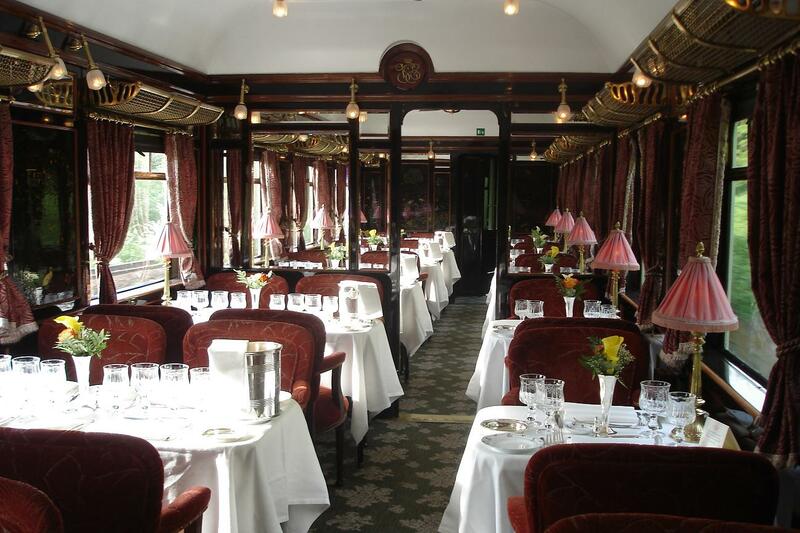 Before dinner, we walked through all the dining cars to admire the decor. After a soda in the bar car, we returned to our cabin and dressed in our finery for dinner. It was a very nice dinner and we enjoyed the company of another couple. The meal had about 4 courses. It was very tasty and extremely filling. We retired to our cabin for awhile and watched the scenery. Then we went for a cup of tea in the bar car. While we were at dinner, Rupurt had converted our cabin with sofa into two bunk beds. I selected the top bunk. It was a noisy night. Wheels chirped and squeaked; trains passed us by on the adjacent rails; cabin doors rattled. 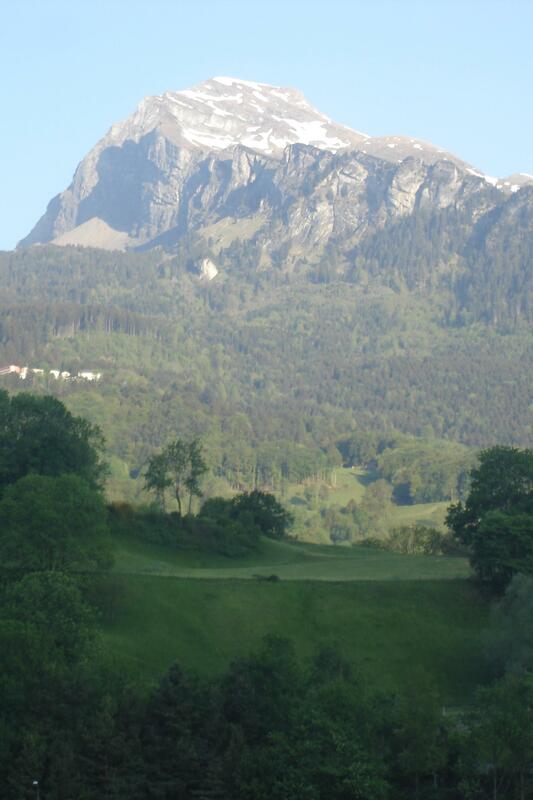 Throughout the night I would wake up and wonder what beautiful scenery of Switerland we might be missing under the dark of night. Posted on May 5, 2011 August 2, 2011 Categories Other travelLeave a comment on All aboard! This was our last full day in London. After breakfast, we walked to the British Museum. We got there right at opening time. We used a Rick Steve’s walking tour to guide us through the Egypt, Assyria, and ancient Greek displays (Rick Steve is a semi-famou s travel guide writer who lives in the Seattle area and have a TV show, radio show and offers tour packages. His audio guides are free on iTunes). It provided an excellent overview of the contents of many displays with good historical background and some details on some significant pieces. We found that the area by the Rosetta Stone was very busy and hard to photograph, but many other displays were fairly easy to see and read the placards. At times we would turn off our audio tours and look around a little longer in a room that interested us. There were excellent mummies and sarcophagi. We also enjoyed the displays for the Parthanon and the Elgin marbles (marble friezes collected by Lord Elgin from the Parthanon). I had also hoped to view the reading room where many scholars have studied and worked, but it was housing a display from Afghanistan and was only open to ticket holders who paid a fee. I decided that I didn’t need to see it that badly. After a small lunch at the museum cafe, we got a taxi cab in front of the museum and went over to the south bank of the Thames River to the Shakespeare Globe Theatre. It was 60 minutes before a matinee performance of All’s Well that Ends Well and we were able to get some nice bench seats in the back where we could lean against the back wall and had a little roof cover over us. People in front of us could not lean against a seat back and were in the bright sunlight. Other people had tickets for the floor space up front but had to stand during the entire performance (or sit on concrete and potentially have a blocked view by others in front of them who would choose to stand). I don’t think that I have seen this play before. I was so bewildered why the male lead part of Lord Bertram would at first scorn his new wife Helena, who he had known for many years and who had request that the king force Bertram to marry her, and then be so overjoyed to learn she was alive after he had thought she was dead. 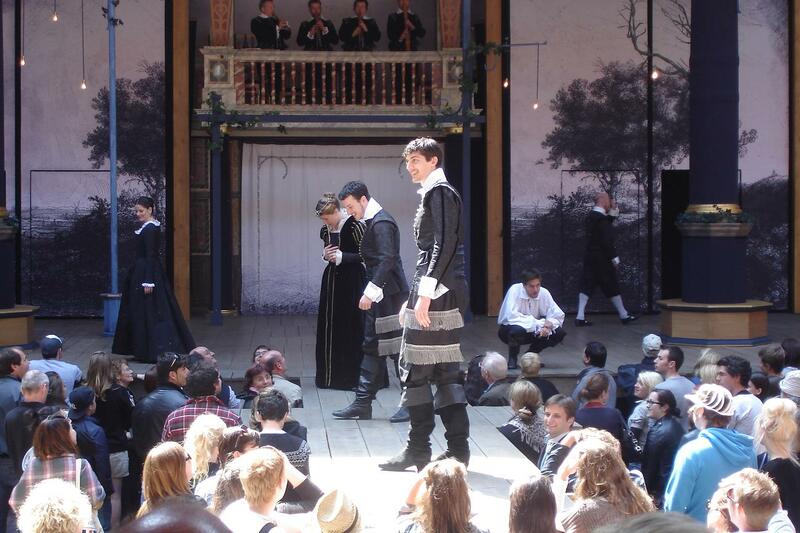 In any case, it was a very good performance and I think it was a good alternative to a trip to Stratford-on-Avon since we did trips to Portsmouth and Bath instead. We walked back to the hotel by following the path along the south bank and stopped for dinner at the Riverfront restaurant. Then we went back to the north side of the Thames over the Waterloo Bridge and through Charington Cross train station. We had tea and pastry near Trafalgar Square. 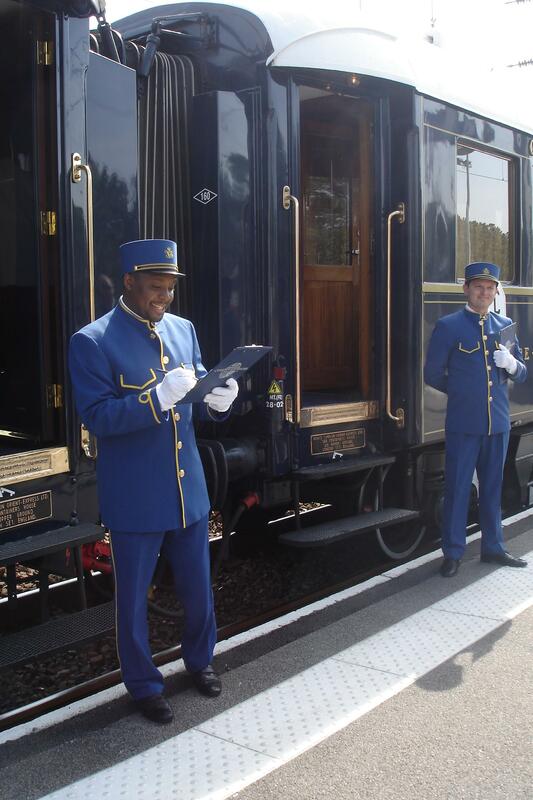 Then it was time to go to our room and pack our suitcases for our trip on the Venice-Simplon Orient Express.